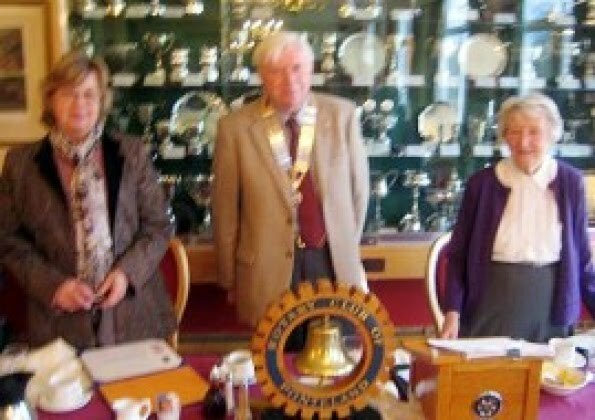 PONTELAND Rotary Club has given out prestigious accolades to two valued members of the local community. President Raymond Tipping presented Paul Harris Fellowship awards to Mrs Bodil (Bo) Boanas and Mrs Marie Brydone. Bo launched 'The Magic Trust' in 1995, a registered charity operating from Ogle Castle. It provides the experience of carriage driving for disabled people – aiming to help people with very severe disabilities, such as muscular dystrophy, stroke, cerebral palsy, multiple sclerosis, motor neurone disease and spinal injuries, who could not otherwise benefit from this enjoyable outdoor activity. Her team of helpers includes several doctors and nurses as well as other volunteers including qualified carriage drivers. Marie is the wife of a Rotarian of long standing and she has been a member of the Inner Wheel organisation for many years. She was involved with the Ponteland Stroke Club, a voluntary organisation, for 29 years until its closure in 2008 and was the club organiser and principal fund-raiser from 1983 until 2008. She organised the weekly running of the club, including outings and transport for its members. The Paul Harris Fellowship was established by Rotary International in 1957 and is awarded in recognition for service to the community or to the club. Each Paul Harris Fellow receives a commemorative certificate and a pin.